Overlake offers camps for students entering 3rd and 4th grades in the 2019-20 school year. Our interdisciplinary, theme-based camps provide engaging and substantive learning opportunities in a fun and relaxed environment. 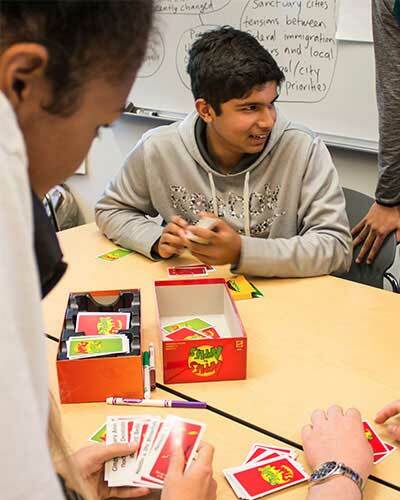 Overlake’s summer camps reflect the school’s values and approach to learning. Most of the camps will be led by Overlake faculty members who are eager to work with this age group. Students are welcome to come for a half-day or stay with us for the full-day experience. Overlake guarantees to run all 3rd and 4th grade camps at the times and dates listed on the website. Each half-day camp costs $195 and will have a maximum of 16 students. Take 10% off each camp if you sign up for two or more half-day camps, and take an additional 10% off if you register before March 4. Come join the fun! Do you like to build, code, and solve complex problems? If so, this camp is for you! In this camp, students will learn how to collaborate and tackle fun problems with a variety of tasks and challenges. Throughout the week, we will work together to solve different building challenges using a variety of materials and strategies, including building and animating creations with Legos. Note: This camp will be led by Mike Hufstader and Julia Noble in June and Julia Noble in July. Centaurs and nymphs. Griffins and gorgons. Heroes and epic journeys. Gods and goddesses. Do you love reading about or watching myths? Do you want to create your own? Then this camp is for you! During this week, we will explore myths in a variety of mediums and learn about the essential elements of any mythological story. Students will then write and illustrate their own myth in the medium of their choice – painting, photo stories, or video creation; whichever way the Muse strikes! Outdoor activities + science = a wonderful opportunity to learn about the amazing Overlake campus. We will explore the campus as scientists and naturalists, discovering Overlake’s plants, animals, and trees. There will be experiments and projects, both indoors and out, where the participants will utilize their general knowledge and learn new facts and information in a fun and exciting way. This interdisciplinary camp celebrates where math, storytelling, and art converge. Using storybooks to channel our imagination, we will complete a variety of math games and art projects to tap into our creativity. Each day there will be a new collection of mathematical principles and artistic possibilities that students can explore through hands-on activities. Come join the fun! Note: This camp will be led by ‘becca Flora and Julia Noble for the first session (July 1-3) and by Julia Noble during the second one (July 29-August 2). Participants will work together to learn skills and use tools to help them solve problems in a fun and creative way. Solutions can involve both science and technology, critical and creative thinking, building and making, and even performance based role-playing situations. This is an activity based camp where the kids will be thinking for themselves rather than being told what to think. They will develop leadership skills and utilize knowledge from a variety of curriculum content areas. For the young athlete, students will play a variety of sports, with a focus on important athletic skills that cross all of them. There will be a focus on how to be a good teammate and how to apply skills and concepts to different settings. Students will be encouraged to pursue sports they already enjoy and try new ones too. Outdoor activities + science = a wonderful opportunity to discover Overlake’s natural beauty and learn survival skills along the way. We will explore the campus as scientists and adventurers, learning how to make shelters, cook food, and navigate back to a home base. There will be experiments and projects, both indoors and out, where the participants will utilize their general knowledge and learn new facts and information in a fun and exciting way. Are you a young, creative writer ready to break the rules in a stress-free, nonjudgmental, and open environment? In this workshop, campers will learn different types of creative writing exercises and craft poems, stories, and character sketches in light of their individual passions. In addition to creative writing, students will make a hand-crafted, miniature book to fill with their writing throughout the week. On the final day, we will share our favorite pieces with parents and Overlake summer staff. This camp provides a variety of experiences and activities that are core to Overlake’s outdoor program. Students will explore the hiking trails in the area and on campus, including Farrel McWhirter, the Redmond Watershed, and Snoqualmie River. We will also spend time on campus setting up tents and conquering Overlake’s challenge course. The camp encourages students to reflect on group process and collaboration skills that are essential to enjoying the outdoors. The Non-Traditional Sports Camp is an activity- and movement-based program. The emphasis is less on competition and more on participating, learning, and having fun. Each day, campers have the opportunity to play a variety of activities. Participants can ride around on ripsticks and razors. They will play badminton, archery, table tennis, floor hockey, circus arts, fistball, four square, GOLA, international games and gym games. Campers learn through a demonstration and explanation of the activities and then get to try out the equipment as they move and explore throughout our space. Join us for this fun and relaxing mini-retreat focusing on self-care and empowerment through yoga and mindful practices. Each day will start with yoga and explore a different method and tool for self-care, including: art exploration; walking meditation; mandala making; aromatherapy; meditation and breath practices; affirmations and visualization; journaling. Over the week each camper will build their personal “self-care toolkit” to bring home on Friday. Do you enjoy using technology? Do you like competing against friends to see who can use technology most effectively? Then Technology Challenge is for you! During this one-week camp, students will compete in 4-5 different competitions that will test your ability to use and understand technology. The challenges all come from the Technology Student Association: Some challenges will focus on engineering (building the strongest bridge), some on talking about technology (promotional marketing) and some on multi-media technology (website design). Do you love reading and writing stories? Are you ready to ignite your imagination while sharpening your writing skills? Whether you're already an incredible wordsmith or looking for inspiration, join us for a fantastic week of all-things creative writing. Together we'll look closely at our favorite stories (and what makes them so great! ), play games to explore story elements (such as character, plot, and setting), examine family photos as we write about special memories, go on a scavenger hunt to collect rich details from all our senses, and much, much more--all while crafting the next literary masterpieces! At the end of the week, campers will celebrate all the writing they’ve done by compiling their pieces into a hand-sewn book to take home.